Thomas Retherford, McClains’ 145-pound entrant, fights to take the back of Tippecanoe’s 145-pound man during their match Thursday at Washington High School. In their final wrestling match before Christmas, the Washington Blue Lions hosted the McClain Tigers for a Frontier Athletic Conference match and also welcomed the team from Tippecanoe (Tipp City) for a tri-match Thursday evening. In the first dual of the evening, McClain defeated Tippecanoe, 65-12. 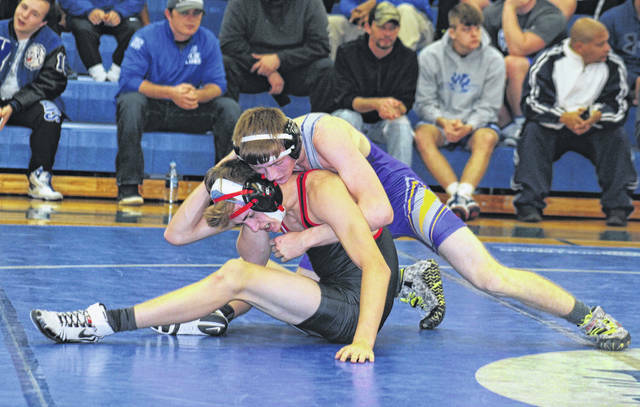 In the middle dual, Washington rolled up a 54-30 win over Tippecanoe. In the conference portion of the night’s action, McClain picked up a rare win over the Blue Lions, 39-33. Shane Paul is now in his eighth year as head coach of the Tigers and he stated that this was his team’s first win over the Blue Lions during his tenure. “We wrestled really well as a team,” Paul said. “The guys wrestled tough. I tell you, the match of the night was at 152 (Keegan Rawlins of McClain against Zane Nelson of Washington, a 2-1 decision going to Rawlins). McClain is now 2-0 in the FAC, along with Jackson. McClain previously defeated Chillicothe in the conference. McClain will host an invitational Saturday, Dec. 30. Teams who will be participating include Campbell County, Ky., nine-time State champions; Youngstown Liberty, Mason and Dayton Christian. Reid spoke about the Rawlins-Nelson match. “Keegan is still undefeated on the year,” Reid said. “That’s Zane’s second loss of the year. It was a tough match. They came out on top. Zane was a State alternate last year. Keegan has that kind of potential. “Collier (Brown) and Jaimie (McCane) wrestled a little bit better than they did last week,” Reid said. “They’re sophomores and they’re still trying to find their place. They had two tough kids in Dylan Trefz and Ethan Taylor. Those are two of McClain’s better kids. Washington’s next match will be Thursday and Friday, Dec. 28 and 29 at Wheeling Park, West Va.
Chris Hoppes is the Sports Editor for the Record-Herald in Washington Court House.